Published: Jan. 7, 2015 at 01:58 p.m. Updated: Jan. 13, 2015 at 04:10 p.m. 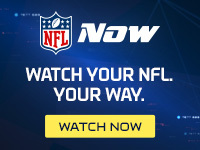 When the Green Bay Packers and Dallas Cowboys meet in Sunday's divisional playoff game, the most explosive offense in the NFL will square off against a no-name defense that's catching fire at the right time. This might look like a lopsided matchup on paper, but after studying the All-22 Coaches Film on both teams, I believe Dallas has the right defensive formula -- provided the unit puts forth an exceptional performance -- to defuse Green Bay's high-powered attack. Aaron Rodgers, QB: The Pro Bowler is one of the most efficient passers in NFL history, having posted six straight seasons with a QB rating of 100-plus. He's a spectacular pocket passer with remarkable arm strength, touch and accuracy. He's also an underrated athlete capable of extending plays within the pocket or carving up defenses with nifty scrambles. Defensive coordinators around the NFL fear his improvisational skills, particularly in Lambeau Field, where he's compiled a 133.2 passer rating and a 25:0 touchdown-to-interception ratio this season. Eddie Lacy, RB: The second-year pro has added much-needed balance to the Packers' offensive attack with his hard-nosed running style. Lacy excels at picking up tough yards between the tackles, particularly on isolations and power plays from an I-formation, and he's also able to catch the ball out of the backfield on swings, screens and checkdowns. He's a big-bodied playmaker who must be accounted for in every situation. Jordy Nelson, WR: The seventh-year pro is not only the Packers' WR1, he is arguably the most explosive pass catcher in the NFL. Nelson tied for second in the league in receiving touchdowns (13) and ranked second in receptions of 40-plus yards (eight) en route to posting his third 1,000-yard season in four years. He is a precise route runner with exceptional speed, quickness and burst. Nelson might be one of the best double-move artists on the perimeter, which makes him nearly impossible to defend in one-on-one matchups. In addition, Nelson is a dynamic runner who can turn short passes into big gains in the open field. Randall Cobb, WR: The Packers' utility man has developed into one of the top slot receivers in the NFL. He is a crafty route runner between the hashes with the quickness and burst to separate from defenders out of breaks. Most importantly, he is a fearless pass catcher willing to make the tough grab in traffic on critical downs. Factor in his versatility (Cobb has lined up at running back, receiver and returner) and production (1,287 receiving yards and 12 touchdowns), and it's easy to see why Rodgers turns to the fourth-year pro when the game is on the line. Davante Adams, WR: The rookie pass catcher has compiled modest numbers as the Packers' WR3, but he's a big-bodied athlete capable of making impact plays on the perimeter. Adams is at his best using his size (6-foot-1, 215 pounds) and strength to overpower defenders on quick routes (slants and quick outs), yet he can also win on vertical routes and double moves. Thus, the Packers will target him frequently on the perimeter when an opponent trots a suspect sub-defender on the field. Andrew Quarless and Richard Rodgers, TEs: The Packers' passing game revolves around the receivers on the perimeter, but the team does have a pair of quality tight ends in Quarless and Rodgers. The duo has combined for 49 receptions, 548 receiving yards and five scores this season. Although the bulk of their work comes on underneath routes, Quarless and Rodgers are big targets adept at catching the ball in traffic in the end zone. Given the attention generally directed toward Cobb and Nelson, the tight end position is the X-factor in the Packers' offense. The Packers get more mileage out of the slant concept than any other team in the NFL. Coach Mike McCarthy will run the slant-flat or double-slant combination from a variety of formations and personnel groupings to give Rodgers an easy throw on the perimeter. In addition, the slant-flat or double-slant combination is an effective counter to blitz tactics, because it allows Rodgers to get the ball out of his hands quickly following a three-step drop (under center) or one-step-and-release (in the shotgun). Thus, when opponents dial up pressure, they're rarely able to get home -- and their cornerbacks, meanwhile, are exposed to one-on-one coverage against a dangerous collection of receivers on the perimeter. 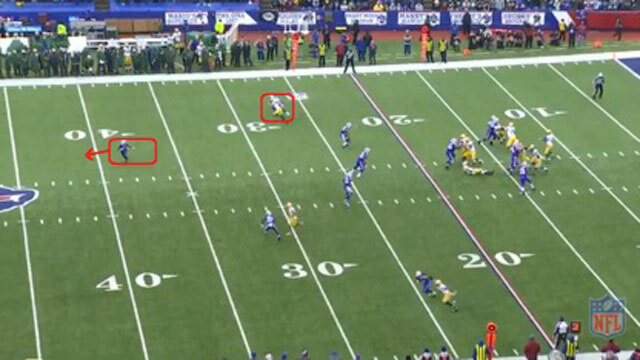 In the play depicted in the video below -- from the Packers' Week 13 win over the New England Patriots -- Nelson is running a slant against Darrelle Revis at the top of the screen. The Patriots are in man coverage, leading Rodgers to target the slant instead of the flat on the play. Nelson wins to the inside and runs away from Revis on a simple pitch and catch from Rodgers. Defensive backs around the NFL will quickly point to Rodgers as the top "fade" thrower in football. The veteran passer displays exceptional touch and accuracy on vertical throws down the boundary, particularly when he delivers the ball on the receiver's back shoulder against defensive backs in ideal position on the go-route. Packers receivers excel at creating room for Rodgers' throws by patiently winning at the line of scrimmage and stacking defenders (the receiver works to get on top and in front of the defensive back following the initial release) early in the route. 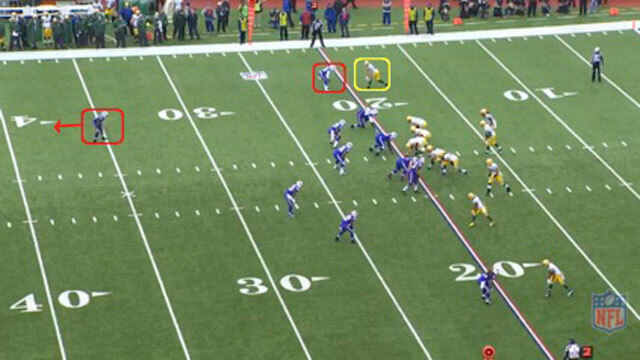 They leave Rodgers plenty of fade room along the sideline, which allows the quarterback to place the ball away from the defender based on his positioning with relation to the receiver. The perfect throw is nearly impossible to defend -- and the Packers' masterful execution of route, throw and catch makes their version of the fade a nightmare for defensive backs. The Packers' renewed commitment to the running game with Lacy in the fold has allowed McCarthy to build a dangerous play-action package. 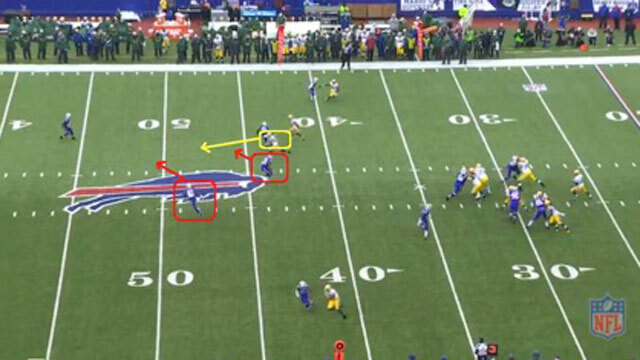 The masterful play designer will frequently instruct Rodgers to use a ball fake to Lacy in the backfield to lure linebackers and safeties to the line of scrimmage, while sending Nelson and Cobb on an assortment of deep crossers, post-routes and stutter go-routes to complement the run action. Given Rodgers' arm strength, accuracy and ball-handling skills, the Packers' clever use of deception allows McCarthy to effectively attack opponents with the vertical passing game. So how can Dallas hope to slow this high-octane attack? 1) Keep it simple and play fast. The Cowboys have played great defense down the stretch by using a simplistic approach under Rod Marinelli. 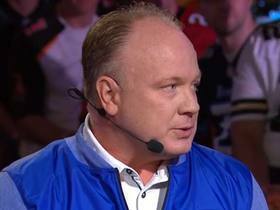 The wily defensive coordinator values effort and technique over trickery; he believes the combination produces turnovers and keeps opponents out of the end zone. Consider what he accomplished with that approach from 2010 to 2012, when he served in the same role with the Bears. In that span, Chicago ranked third in interceptions and first in forced fumbles and defensive scores while allowing the fourth-fewest points in the NFL. Marinelli has already begun to transform the Cowboys' defense into a potential power, with the team holding eight opponents to 21 points or less in the regular season and notching 18 interceptions. During Dallas' recent five-game winning streak, the team has held opponents to 19.8 points per game and registered 15 takeaways. Remarkably, the Cowboys are doing it with a scheme that features a handful of looks straight out of a high-school playbook. Looking at the All-22 Coaches Film, I was blown away by the simplicity and effectiveness of Dallas' recent game plans. The team is using basic coverage principles to stuff the run and suffocate passing games on the perimeter. From traditional Cover 3-buzz (three deep, with a safety dropping down as a middle-hook dropper) to a variety of Cover 1 "Lurk" or "Rat" schemes, the Cowboys are mixing in some man and zone tactics to accentuate the strength of their defensive backs on the perimeter. Orlando Scandrick and Brandon Carr are at their best in man coverage, particularly bump-and-run at the line of scrimmage. The shift to single-high coverage, including zone-dogs, allows Dallas to put its defensive backs in optimal position. It also enables the linebackers and nickel backs to play with vision on the quarterback and make quicker breaks on throws. Although the Cowboys will mix in some Tampa-2 on long-yardage situations and throw in a five-man pressure on occasion, the defense has thrived behind an approach that keeps a deep safety in the middle and dares quarterbacks to work the ball downfield on an assortment of short and intermediate throws to the perimeter. From a pressure standpoint, the Cowboys feature a four-man pass rush on most downs, with the defensive line using a variety of straight rushes, simple twists and games. The tactic is occasionally complemented with a bluffed A-gap blitz by Rolando McClain or Bruce Carter, to divert the attention of the center away from the twists heading into the interior gaps. In the play depicted in the video below -- from the Cowboys' win over the Detroit Lions in the wild-card round -- Dallas is using a straight four-man rush, with Anthony Spencer crashing off the edge. Spencer simply uses his speed and quickness to blow by right tackle Cornelius Lucas on the way to the quarterback. When Spencer gets close to the quarterback, he attack Stafford's arm and knocks the ball loose for a fumble (which is recovered by Demarcus Lawrence, who subsequently coughs it up, returning possession to Detroit). Against the Packers, the Cowboys will have to play fast to contain an offense that is scoring 39.8 points per game at Lambeau Field. Dallas must throw an assortment of stunts and twists at Green Bay's offensive line, to see if cracks can be created at the line of scrimmage. Although these tactics are unlikely to produce a bevy of sacks, based on Rodgers' athleticism and mobility, the steady pressure, coupled with tight pressure on the back end, can disrupt the rhythm of the passing game and help the defense get off the field in key moments. 2) Neutralize Nelson and make the Packers' other receivers win. Nelson is the Packers' most explosive weapon, and Rodgers loves to target him for home-run plays. Given the impact of such plays, Dallas should commit to stopping No. 87 at all costs and force Cobb or one of the other receivers to carry the offensive load. Not to slight Cobb as a playmaker, but he did go six straight games this season without scoring a single receiving touchdown. The Cowboys would be wise to shade a safety toward Nelson and take their chances defending Cobb and Co. in man coverage. The Cowboys have relied on similar tactics in their Cover 1 "Lurk" or "Rat" scheme, with a safety positioned in the deep middle and an underneath defender (linebacker or safety) acting as a robber in the middle, as can be seen in this interception of Mark Sanchez in Week 15. This concept will not only allow the Cowboys to keep a safety over the top of Nelson for a deep throw, but it should also put a defender in the perfect spot to make a bang-bang play on a slant or crossing route over the middle. Given the Packers' affinity for those plays, I would expect to see the Cowboys utilize a lot of Cover 1 in this matchup. 3) Unleash the linebackers in the middle of the field. The Cowboys entered the season with major question marks at linebacker, but the team's corps has played well this year. Rolando McClain, Bruce Carter and Anthony Hitchens have made timely plays against the run and pass while displaying the disruptive skills every team needs along the second level. McClain, in particular, has been a bully in the middle of the Cowboys' defense, thanks to his hard-hitting style. He punishes runners between the tackles, yet displays the awareness to run down the seam with receivers in zone coverage. In addition, McClain -- who has been held out of practice due to concussion symptoms -- will bring pressure on a few "Mike" A-gap blitzes, to disrupt the timing of the passing game. Carter has quietly emerged as the defense's top playmaker as the "Will" linebacker in Marinelli's scheme. He finished the season with five interceptions and eight passes defensed despite logging just eight starts and 13 appearances. Carter's speed, quickness and athleticism have been key to the Cowboys' underneath coverage in man and zone concepts. The 6-2, 240-pounder capably runs with backs on swings and wheel routes in man while also showing the anticipation to jump short and intermediate routes in zone. When used as the hook dropper in a Tampa-2 zone or man blitz, Carter has repeatedly come up with big plays or game-clinching interceptions. Facing a Packers offense that could elect to run the ball early with Lacy to alleviate some of the pressure on Rodgers, McClain and Carter will need to be fixtures near the line of scrimmage following the snap. They must run through their assigned gaps on running plays and pursue like mad men when Lacy cuts back. Additionally, McClain and Carter must be able to hold up in coverage against the Packers' fast-paced tactics. Rodgers will keep the Cowboys' base defense on the field with a no-huddle approach, in an effort to exploit any weaknesses he spots in coverage. As a result, the Cowboys could be forced to play with their big bodies against the Packers' spread sets. Consequently, the performance of the linebackers could determine whether the Cowboys are able to get off the field in critical situations.